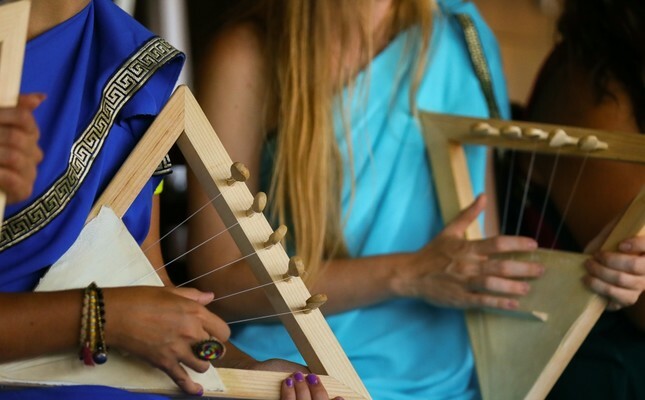 Doctors and musicians aiming to reintroduce the ancient treatment method of music therapy combined with a modern scientific approach, came together in a program organized in Bergama, İzmir, which served as a health center in the ancient world.The Asklepion Music Therapy Camp, organized by the GETAT (Traditional and Complementary Medicine) Application Center of the Health Sciences University, brought together doctors, medical workers, musicians, music instructors and academics conducting studies in this field. In addition to Western medicine, participants received certificates in the three-day camp where therapy methods, practices and training was given with old and modern music, aimed to heal those who have health problems in areas of neurology, psychiatry and pediatrics. GETAT Director and Bağcılar Training and Research University Chief Physician Urologist, professor Dr. Ahmet Müslümanoğlu told Anadolu Agency (AA) that traditional medicine dates back to the ancient times according to registered history, and that there is a history of 7,000 years in the city of Bergama.Noting that they deal with modern diagnosis and treatment methods and traditional medicine with a holistic approach, Müslümanoğlu said traditional medicine also covers social issues such as "social environment, genetic characteristics and eating habits." He also added that in 2014, the Ministry of Health created regulations on 15 subbranches of traditional medicine within the scope of traditional and complementary medical treatment, and that these branches also covered "music therapy" including the sound of water, people, and musical instruments. Müslümanoğlu said that music therapy is applied to psychiatric and neurological patients and newborns in intensive care and that music modes that relieve and cure the patients are used within the scope of treatment. He added that physicians frequently used the same methods in the Seljuk and Ottoman periods.Bağcılar Training and Research Hospital GETAT Center Chief Physician, Dr. Kanat Tayfun said that doctors, health professionals and academic staff involved in music attended the program. In the program, Tayfun said that those engaged in musical activities were able to recognize diseases, while the doctors were taught how to use music in the treatment of disease, expressing that music therapy areas benefit from the possibilities provided by modern medicine such as drugs, along with the power of music. Providing details on music therapy, Tayfun explained that the patient comes to them after getting a diagnosis, which can range from a musculoskeletal disorder to depression, and then they determine the most suitable type of music for the patient according to his/her nature by talking to the patient and family members. "We stay away from the type of music that will recreate a bad moment. Sometimes two siblings who have the same diagnosis do not like the same music. Especially oriental medicine has many modes. Ottoman physicians distinguished the music to be performed according to diseases and even zodiacs. They wanted certain music to be played at certain times," Tayfun said. "The doctor and musician decide which mode will affect the patient. There are scales to measure the degree of depression. We can measure the benefit of the therapy with the answers received before and after therapy is started." Tayfun stated that the duration of music therapy can be determined according to the duration of the disease, pointing out that they conduct treatment under hospital conditions, that they apply it first in addiction treatment and that some doctors participating in the program can also practice music therapy by playing an instrument themselves.